The neuron (nerve cell) is the fundamental unit of the nervous system. The basic purpose of a neuron is to receive incoming information and, based upon that information, send a signal to other neurons, muscles, or glands. Neurons are designed to rapidly send signals across physiologically long distances. They do this using electrical signals called nerve impulses or action potentials . When a nerve impulse reaches the end of a neuron, it triggers the release of a chemical, or neurotransmitter. The neurotransmitter travels rapidly across the short gap between cells (the synapse) and acts to signal the adjacent cell. Communication by neurons can be divided into four major steps. First, a neuron receives information from the external environment or from other neurons. For example, one neuron in the human brain may receive input from as many as one hundred thousand other neurons. Second, the neuron integrates, or processes, the information from all of its inputs and determines whether or not to send an output signal. This integration takes place both in time (the duration of the input and the time between inputs) and in space (across the surface of the neuron). Third, the neuron propagates the signal along its length at high speed. The distance may be up to several meters (in a giraffe or whale), with rates up to 100 meters (328 feet) per second. Finally, the neuron converts this electrical signal to a chemical one and transmits it to another neuron or to an effector such as a muscle or gland. When combined into networks, neurons allow the human body memory, emotion, and abstract thought as well as basic reflexes. The human brain contains an estimated one hundred billion neurons which relay, process, and store information. Neurons that lie entirely within the brain or spinal cord are referred to as interneurons and make up the central nervous system . Other neurons, receptors, and afferent (sensory) neurons are specialized to receive signals from within the body or from the external environment and to transmit that information to the central nervous system. Efferent neurons carry signals from the central nervous system to the effector organs (muscles and glands) of the body. If an efferent neuron is connected to a muscle, it is also called a motor neuron. The ability of a neuron to carry out its function of integration and propagation depends both upon its structure and its ability to generate electrical and chemical signals. While different neurons have different shapes, all neurons share the same signaling abilities. Neurons have many different shapes and sizes. However, a typical neuron in a vertebrate (such as a human) consists of four major regions: a cell body, dendrites, an axon , and synaptic terminals. Like all cells, the entire neuron is surrounded by a cell membrane. The cell body (soma) is the enlarged portion of a neuron that most closely resembles other cells. It contains the nucleus and other organelles (for example, the mitochondria and endoplasmic reticulum ) and it coordinates the metabolic activity of the neuron. The dendrites and axon are thin cytoplasmic extensions of the neuron. The dendrites, which branch out in treelike fashion from the cell body, are specialized to receive signals and transmit them toward the cell body. The single long axon carries signals away from the cell body. In humans, a single axon may be as long as 1 meter (about 3 feet). Some neurons that have cell bodies in the spinal cord have axons that extend all the way down to the toes. Axons generally divide and redivide near their ends and each branch gives rise to a specialized ending called a synaptic knob (synaptic terminal). It is the synaptic terminals of a neuron that form connections either with the dendrites or cell body of another neuron or with effector cells in muscles or glands. Once an electrical signal has arrived at the end of an axon, the synaptic terminals release a chemical messenger called a neurotransmitter, which relays the signal across the synapse to the next neuron or to the effector cell. Neurons can be classified according to the number of processes that extend from the cell body. Multipolar neurons are the most common type. They have several dendrites and one axon extending from the cell body. Bipolar neurons have two processes extending from the cell body, an axon and a single dendrite. 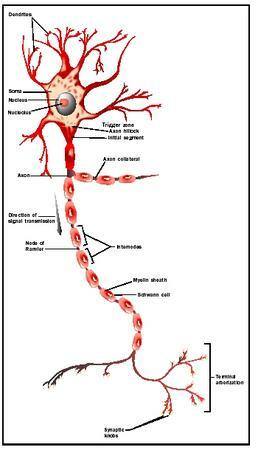 This type of neuron can be found in the retina. Unipolar neurons are generally sensory (afferent) neurons that have a single process, which then divides into two. One of the two processes extends outward to receive sensory information from various areas of the body, while the other process relays sensory information towards the spinal cord or brain. All living cells have a separation of charges across the cell membrane. This separation of charges gives rise to the resting membrane potential . Scanning electron micrograph of two types of neurons: a bipolar neuron (top) and a developing neuron (bottom). Neurons and muscle cells both use brief changes in this resting membrane potential to quickly send signals from one end of the cell to the other. In neurons, electrical signals called action potentials propagate from the cell body down the axon to the synaptic terminals, where stored neurotransmitter is released. Action potentials are transient, all-or-none changes in resting membrane potential that travel along the axon at rates of 1 to 100 meters per second. Myelin, a fatty insulating material derived from the cell membranes of glial cells, covers the axons of many vertebrate neurons and speeds the conduction of action potentials. The importance of this myelin covering to normal nervous system function is made painfully obvious in individuals with demyelinating diseases in which the myelin covering of the axons is destroyed. Among these diseases is multiple sclerosis, a demyelinating disease of the central nervous system that can have devastating consequences, including visual, sensory, and motor disturbances. Although neurons share many of the features found in other cell types, they have some special characteristics. For example, neurons have a very high metabolic rate and must have a constant supply of oxygen and glucose to survive. Also, mature neurons lose the ability to divide by mitosis . Until the late twentieth century it was thought that no new neurons were produced in the adult human brain. 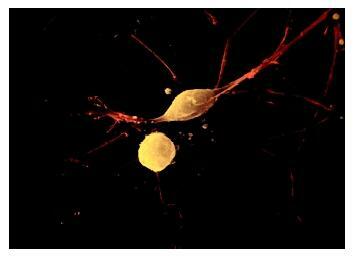 However, there is evidence that, at least in some brain areas, new neurons are produced in adulthood. This finding suggests an exciting avenue for possible approaches to treating such common neurological diseases as Parkinson's disease and Alzheimer Disease, which are characterized by the loss of neurons in certain brain areas. Kandel, Eric R., James H. Schwartz, and Thomas M. Jessell. Principles of Neural Science, 4th ed. New York: McGraw-Hill, 2000. Kemperman, Gerd, and Fred H. Gage. "New Nerve Cells for the Adult Brain." Scientific American 280, no. 5 (1999): 48–53. Purves, Dale, et al. Neuroscience, 2nd ed. Sunderland, MA: Sinauer Associates, 2001. American physiologist who invented the microelectrode, a tiny needle used to measure electrical activity in living cells. The microelectrode was fundamental to studies of nerve and muscle cells. Hyde was the first woman elected to the American Physiological Society and the first woman to conduct research at Harvard Medical School. I want to learn more about the human brain.And also know how to treat the brain when it gets a problem. I also want tobe come a biological docter after completing senior high school. Thank you. if you know of any scholarship opportunities i could look into, i would appreciate the feedback.